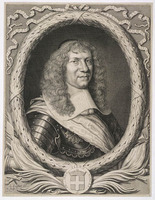 JOYBERT (Joibert) DE SOULANGES ET DE MARSON, PIERRE DE, soldier, seigneur, and administrator of Acadia; b. 1641 or 1642 in Saint-Hilaire de Soulanges in Champagne; baptized in 1644; d. 1678. At an early age he apparently joined the Briquemault regiment and served in Portugal. 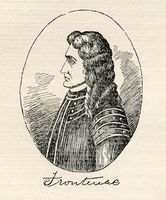 In 1665 he arrived at Quebec as a lieutenant in Hector d’Andigné de Grandfontaine’s company of the Carignan-Salières regiment, and took part in Prouville de Tracy’s expedition against the Iroquois the next year. He returned with his commander to France in 1667 because of the war over the Spanish Netherlands. 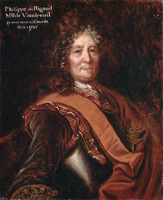 When, late in 1669, Grandfontaine was selected to take possession of Acadia under the terms of the Treaty of Breda, Joybert was one of the men chosen to accompany this officer. Their vessel was wrecked on the coast of Portugal near Lisbon in January 1670, but Joybert and the others were saved, and as soon as possible the expedition was reorganized and dispatched to Boston in the Saint-Sébastien. Joybert was present at the handing over to French authority of Fort Pentagouet, and on 14 August he was ordered to accompany Richard Walker, who had been Col. Thomas Temple’s deputy governor of Acadia, in the Saint-Sébastien, to take possession of various other posts in Acadia. On 27 August he accepted the surrender of Jemseg, the fortified trading-post that had been built in 1659 by Temple on the Saint John River 50 miles from its mouth, and on 2 September at Port-Royal, he took possession of that place and also accepted the surrender of Fort La Tour at Cap de Sable. That fall Joybert was ordered to Boston by Talon to deliver some letters and to secure information about the French merchant vessel La Fontaine that had been seized by the English, together with her valuable cargo. His conduct on this mission was criticized by Grandfontaine who sent him to Quebec to explain his conduct to Talon. Talon reported the dispute to the king but was unable, or unwilling, to deal with the serious disagreement, the details of which are not known. It was at Quebec, on 17 Oct. 1672, that Joybert married Marie-Françoise, daughter of the attorney-general of New France, Louis-Théandre Chartier de Lotbinière. On 20 Oct. 1672, in recognition of his “good and praise-worthy service to the King, both in Old and New France,” he received a seigneurial grant on the east bank of the Saint John, measuring 1 league in depth and extending 4 leagues up the river from its mouth. This large area included a part of the site of the present city of Saint John. At the same time, he was promoted to “Major des troupes” in Acadia and assigned command of Fort Jemseg (called Gemisick by the French) and the river Saint John by Buade de Frontenac. It is doubtful if there was a single white resident at the time on the Saint John, and his appointment appears to have been part of a plan to settle soldiers and families on that river as an aid in establishing an inland route of communication between Quebec and Acadia. On the very same day, his brother Jacques was issued a seigneurial grant adjoining that of Joybert at the mouth of the Saint John. Joybert turned his attention to repairing and strengthening the post at Jemseg. But, with his garrison of nine men, he was in no condition to resist when a Dutch force under Jurriaen Aernoutsz pillaged the post and took Joybert a prisoner to Boston on 7 Aug. 1674. A ransom of 1,000 beaver pelts, or the equivalent, was placed on Joybert. Word of the capture reached Frontenac at the end of September and he immediately sent men with canoes to find out what was happening in Acadia, and to bring Mme de Soulanges with her infant daughter via the Saint John–Rivière du Loup route to Quebec. Joybert appears to have remained a captive at Boston until ransom had been arranged by Frontenac, probably late in 1675. He then went to Quebec, reporting to Frontenac for duty and being sent back to command the Saint John River area. On 12 Oct. 1676 he received a grant at “Nachouach” (Nashwaak) measuring 2 leagues wide by 2 leagues deep on both sides of the river, and including the site of the present Fredericton. This concession was made by Frontenac in consideration of Joybert’s service in Acadia and “desiring to engage him to continue them.” Just four days later, Joybert’s petition to the king for another grant was heard. In this, he spoke of using his own funds to repair Jemseg both before and after the Dutch raid, and of the fact that he had lost everything as a result of that raid. His request was complied with, and the grant issued included Fort Jemseg itself, together with land measuring 1 league on either side of it and 2 leagues in depth. In all, the three seigneuries comprised more than 100 square miles. In 1677 Joybert was named administrator of Acadia, succeeding Jacques de Chambly, and Jemseg became the seat of French power and the capital of the country. 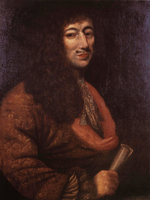 He died about 1 July the following year and was succeeded by Michel Leneuf* de La Vallière. Joybert was survived by his widow and two children. The elder, Louise-Élisabeth, afterwards became the wife of Philippe de Rigaud* de Vaudreuil, governor-general of Canada, and the mother of ten children, including Pierre de Rigaud* de Vaudreuil de Cavagnial, who was the first native-born governor of Canada. 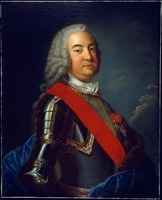 Joybert’s second child, Pierre-Jacques, became a soldier and died of smallpox at Quebec in 1703. A third child died in infancy. In the years following her husband’s death Mme Joybert appears to have divided her time between Quebec and the Saint John River, where she continued Joybert’s fur-trading activity. However, her circumstances were such that Intendant Duchesneau felt obliged to give her 300 livres following Joybert’s death, and an annual pension in the same amount was eventually granted. On 31 March 1691 the widow received a new seigneurial concession on the Saint John opposite Jemseg, including much of the present Camp Gagetown. Title to this grant, and to the three that had been granted Joybert, was to lapse due to non-fulfilment of conditions. Mme Joybert herself died in Paris in 1732. AN, Col., C11A, 3. Collection de manuscrits relatifs à la Nouv.-France, I. Correspondance de Frontenac (1672–82), APQ Rapport, 1926–27, 17, 73, 74, 88, 90, 96, 111. Correspondance de Talon, APQ Rapport, 1930–31, 156, 157, 176, 179. Jug. et délib. Mémoires des commissaires, I, 151; II, 323–26, 566–70, 573–75; IV, 37, 288–89; and Memorials of the English and French commissaries, I, 25, 206, 413, 611–13, 744, 746, 748. P.-G. Roy, Inv. concessions, II, III, IV. Claude de Bonnault, “Branche canadienne des Joybert,” BRH, XLII (1936), 110–16. Ganong, “Historic sites in New Brunswick,” 274–75, 277, 309–12, 314. Beamish Murdoch, History of Nova-Scotia. Rameau de Saint-Père, Une colonie féodale. W. O. Raymond, The River St. John, its physical features, legends and history from 1604 to 1784, ed. J. C. Webster (Sackville, 1943). P.-G. Roy, La ville de Québec, I, 362. Régis Roy, “La famille de Joybert,” BRH, XV (1909), 223; Régis Roy and Malchelosse, Le régiment de Carignan. Sulte, Mélanges historiques (Malchelosse), VIII. Bibliothèque et Arch. Nationales du Québec, Centre d’arch. de Québec, CE301-S1, 17 oct. 1672. George MacBeath, “JOYBERT (Joibert) DE SOULANGES ET DE MARSON, PIERRE DE,” in Dictionary of Canadian Biography, vol. 1, University of Toronto/Université Laval, 2003–, accessed April 20, 2019, http://www.biographi.ca/en/bio/joybert_de_soulanges_et_de_marson_pierre_de_1E.html.